Sleeps one couple and two others (plus baby). Classic Cape 5-roomed superb & unique Cottage, built in the late 1800’s. Elegantly restored to its former glory. 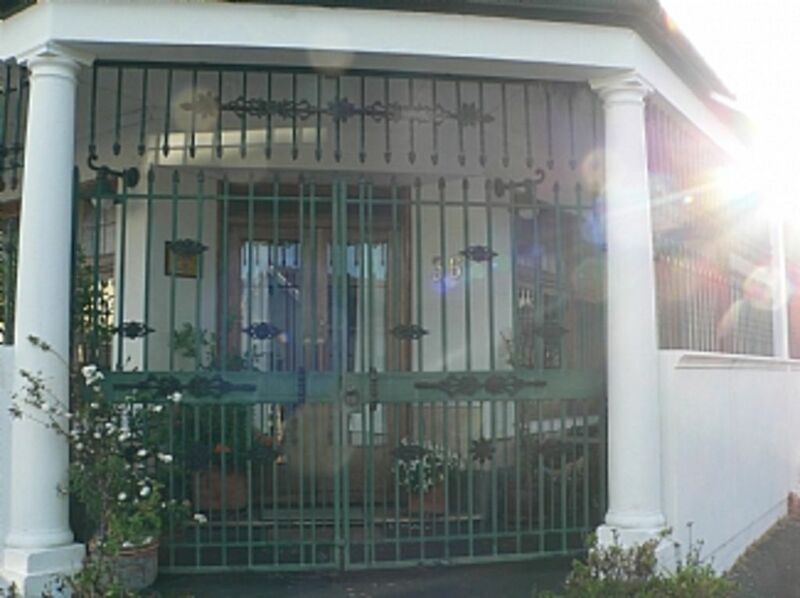 In Kenilworth, the heart of Cape Town, 2 minutes from the Kenilworth Race Course and 5 from famous Royal Cape Golf Course. Easy, quick access to Cape Town’s many attractions: Table Mountain, Rhodes Memorial, Kirstenbosch Botanical Gardens, Groot Constantia Estate, Indian and Atlantic Oceans , the Wine Routes and many 5 star restaurants to name but a few. Luxurious accommodation, perfect for entertaining and special occasions (top class caterers available). Fully equipped and serviced daily except Sundays and public holidays. Secure lock- up and go with daily security/car guard. Intimately stylish, exquisite, décor with the charm of a bygone era and careful attention to attention to detail. All your needs provided for, Coote’s offers you a superb 'home away from home’ stay. Victorian Bedroom & Bathroom en-suite, stunning antique brass bed & lamps ,mirrors, classic décor & period pieces, quality inviting linen. French glass doors open out into tranquil, private Japanese Garden. Tranquil & idyllic serene Japanese Garden with bird bath & birds (resident Cape Robin), fish ponds with Koi fish & running water, wooden bridge, benches, bamboo(black & green! ), trees, flowers & ginger plants with their magnificent aroma and a grape vine to enable you to read, meditate/ contemplate & relax in total privacy. Accommodation is magical for a couple (honey-mooning or needing something special), special occasion celebrations,Ex-patriots needing to entertain, small weddings or engagements. Takes 30 seated with all antique / period crockery, cutlery & linen available. Sleeps a couple, another + baby Classic 5 roomed unique Cape Cottage built in the 1800’s In Kenilworth, the heart of Cape Town, minutes to Kenilworth Race Course, famous Royal Cape Golf Course. Easy, quick access to Cape Town attractions: Table Mountain, Rhodes Memorial, Botanical Gardens, Groot Constantia, Indian and Atlantic Oceans, Wine Routes, restaurants etc. Ideal for entertaining and special occasions. Fully equipped, serviced daily. Secure lock up and go. Built in the late 1800’s, Coote’s is an original and unique Cape Cottage. With unemployment being such a mammoth problem in South Africa, we felt we could make something of a contribution by taking one person at a time and making an investment into their skills development. With this in mind, we tried identifying what opportunities exist using unskilled labour. We saw a gap in the market, via woodwork, restoration and tourism. Coote’s is at the corner of Goldbourne and Wargrave Road, Kenilworth. This was where we started. This corner has had many an identity from corner shop to butchery and a few things in between. Having set eyes on the property, the vision of what it could be, developed. Given its age & character, it could with effort, careful attention to detail and love, enable a trip back in time to a lost and bygone Cape era, for those who chose to experience such. After purchasing the property, Joe Mgungu (an illiterate gardener) was selected for skills development, by being part of the restoration project: To restore the property back to the period in which it was built. Together we attended Woodwork Joinery Classes at Thornton Technical College and after completing the course, we started the project. Unemployed labourers were hired daily (from the streets) and guided in the slow task of restoring and rebuilding. Today, nearly every piece in the cottage from the window frames to the tables and chairs, crockery & cutlery is of the period. Now this historic home has been elegantly restored to its former glory. Exquisitely furnished with Victorian period pieces (many restored by us), it offers guests a luxurious experience of Classic Cape in a well situated position. NOT air conditioned but due to age of cottage and thickness of walls, always cool in summer.. Heating in all rooms including bathroom. Top Quality Percale Linen provided. Off-street but not inside parking. Car guard on duty. Superb dining facilities. Antique crockery & cutlery. Excellent caterers. Period Linen. Ambiance par excellence! Notes on accommodation: Accommodation is superb for a couple (honey-mooning or needing something special),special occasion celebrations,Ex-patriots needing to entertain,small weddings Takes 30 seated with all antique / period crockery,cutlery & linen available Beautiful décor & attention to detail Coote’s enables you to step back in time & experience a bygone Cape era Private armed response and alarm system 24/7 Corner security guard (opposite entrance) Outside: Tranquil & idyllic Japanese Garden with bird bath & birds (resident Cape Robin), fish ponds(Koi) & running water, wooden bridge, benches, bamboo(black & green! ), trees, flowers & ginger plants with their magnificent aroma and a grape vine to enable you to read, contemplate or just relax in total privacy. A surrounding enclosed veranda with teak church-pew benches for sunrise tea, sunset cocktails flows from the utility area and garden Utility Room: Ironing area with ironing board, drying rack, wine rack, Salton warmer trays & cot Additional access to street and kitchen(for unpacking purposes) Cleaning / Towels / Linen / Maid service: All linen included (quality linen) + towels Serviced daily except public holidays +Sundays Linen & towels changed weekly or fresh towels on request Laundry on request, separately charged for Other: Surrounding enclosed veranda with antique teak church-pew benches for sunrise tea,sunset cocktails Utility Area:Iron,ironing board,drying rack,wine rack,salton warmer trays & cot Additional access to street and kitchen(for unpacking purposes). Car hire is useful and or airport collection can be arranged. Excellent local Spa,supermarkets,shopping centres.Great pubs & restaurants including 5*. Corner café for quick needs.